Top notes: Bergamot, lemon and petitgrain. Middle notes: Rose Centifolia absolute, Bulgarian rose essence and patchouli. Base notes: Labdanum cistus, opoponax and Bourbon vanilla. The beautiful Ottoman spyactually laughed when she saw the small crystal bottle of perfume that had been made especially for her. It featured a brightly decorated elephant, alluding to the verse of Valmiki’s Ramayana. Spiritual and multilingual, Kismet cultivated the mystery surrounding her background. She reigned over the Parisian parties of the Roaring Twenties for a time, then one day slipped away, never to be seen again. All that remained was the memory of her intoxicating scent — the scent of the perfume that Lubin had created for her. “Folly!” That’s how the elderly owner of the Lubin Perfume House, Monsieur Paul Prot, described the elephant-shaped perfume bottle that had appeared on his desk. It had been designed for a princess who was believed to be Indian, and so Lubin perfumers had consulted the writings of the famous Indian poet Valmiki. In his work, Valmiki paid homage to Woman by comparing her to the animal believed to be the noblest of all — the elephant. This seemed altogether odd to a well-mannered Frenchman in the early Roaring Twenties. 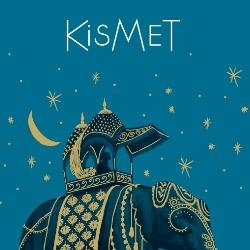 But as for Kismet, the Eastern princess for whom this new perfume was intended, well, she liked it.